A B-movie straining hard to join the A-list, Outpost In Morocco cannot overcome its suspect foundations. 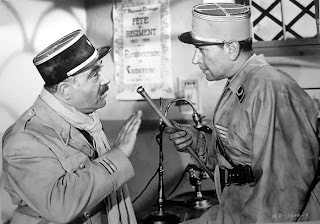 The story of French Foreign Legion troops confronting a tribal insurrection in Morocco boasts impressive location shooting, but has limited content and is hampered by decidedly mediocre talent. Captain Paul Gerard (George Raft) of the French Foreign Legion in Morocco is a notorious womanizer, but is nevertheless assigned by headquarters the mission of escorting the headstrong Cara (Marie Windsor), the daughter of tribal chief Emir of Bel-Rashad (Eduard Franz), across the desert to her father's city. Predictably, Gerard and Cara initially clash but the journey ends with them very much in love. The Emir thanks Gerard for delivering his daughter, but also hints that the tribes are restless and tired of being ruled by the French occupiers. Gerard and his men stop at the nearby Legion fort of Commandant Fronval (Damian O'Flynn) and Lieutenant Glysko (Akim Tamiroff). Gerard sneaks back into Bel-Rashad and discovers preparations for a rebellion in full swing, with modern rifles being distributed to hordes of tribesmen. With Gerard and Glysko back at headquarters reporting on what they found, the tribes attack Fronval's fort, killing the Commandant and all his men. Gerard, Glysko and strong reinforcements take over the fort and retaliate by raiding the Emir's palace and taking Cara hostage. A siege ensues, the Emir attempting to force Gerard to surrender by cutting off the fort's water supply, but Gerard holding Cara as a potential bargaining chip. Outpost In Morocco was filmed with the rare cooperation of the Foreign Legion, and although the location scenery is impressive and the film does carry authentic boot dust and uniforms stained with sticky sweat, it's difficult not to notice the hamfisted glorification of the Legion, particularly with the dopey ending. But the film's problems are bigger than the tone-deaf approach to colonial obtrusiveness. George Raft, at 54 years old, is many years past being able to pull off a Captain Gerard role with any conviction, either as a romantic lead or as an action hero. There is nothing in the story to suggest the possibility of a genuine romance, as the characters of Gerard and Cara jump from edgy bickering to doltish loving in an astonishing instant. Worse still are clumsy attempts to portray a disguised Raft as an athletic soldier sneaking up on his enemies and acrobatically making an escape, the actor's laconic, I'm-not-Bogart-but-I'm-trying persona clashing with the role's physical demands. 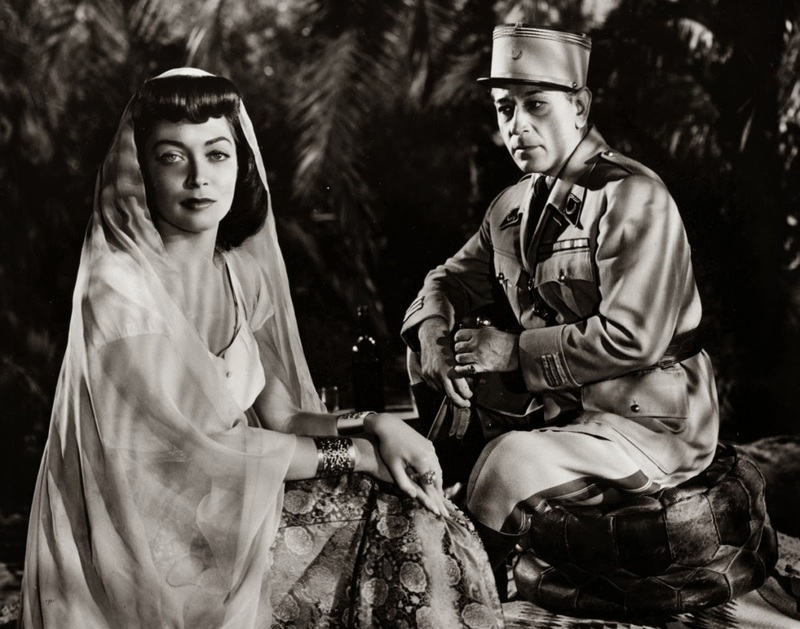 A miscast Marie Windsor does not help at all, her stiff screen presence confirming her "Queen of the Bs" title, nothing in her performance suggesting that she is anything but a second tier starlet awkwardly playing dress-up as the daughter of a desert tribal leader without knowing the first thing about what that may mean. Tamiroff's animated Lieutenant Glysko emerges as the most committed performance. French-American director Robert Florey does the best with what he has, focusing more on the characters, creaky as they are, and less on action, probably more for budgetary reasons than any higher order artistic ideals. With none of the characters afforded any depth, the result is a film that drags somewhat in its second half, despite the compact 92 minute running length. Outpost In Morocco is not short on ambition, but unfortunately short in most other areas.